❤【Colorful, Bright Light:】Adopted 54pcs colorful LEDs, include 48pcs RGB LED side lights and 6 RGB rotating LEDs in the center. (16 red leds, 16 green leds, 16 blue leds). The stage light can make single color light or conbination of 2 or 3 colours light (total of seven kinds of light colors). It will create a romantic party atmosphere for you ! ❤【Modes:】Sound Activated, Voice control and Automatic lighting. With the dynamic receiver, pattern can flash with musical rhythmic. The Sound control light is depending on which rhythm or which kind of music is played, the sound changes and flashes to the music. ★【Hassle-Free Installation:】The stage light is easy to open.Ease installation,just plug and play, safe and reliable. Small and exquisite appearance. This stage light adopts high-quality super-bright LEDs, having the advantage of small power consumption, low heat and long lifespan, excellent stability. ❤【Light That Is Romantic On The Eyes:】The stage light provide impressive visual dynamic magical dream effect, such as gradual changing, hopping, etc. All this wonder and beauty of the night sky happen in your room! ★【Wide Application:】The magic stage light is perfect for indoor DJ, disco, car, partylight, clubs, home, children’s room, par, christmas party, celebration .This product is also suitable for all parties such as family celebrations, friends parties and birthday parties etc. It will not only give a wonderful universe to your children, but also create a romantic surprise for lovers! • Light exposure area of about 15-30 square meters (161-322sq ft).No remote control, you can change the color with the music rhythm! No switch,closing stage lights need to cut off the power. • Strobes Effects, red, green, blue colors rotate and change, showing you a fantastic world to enjoy. • Long working life, excellent stability,small and exquisite appearance. Control Mode : intelligent voice. 1. This device is designed for indoor use. Please keep it dry whenever using. 2. Do not stare at the lighting source. 3. Please keep away form children,or use it under the adult supervision. 4.When not used,turn off device to extend the service time. ★Artistic and exquisite magic ball appearance, easy to use, plug and play. ❤This LED stage light is ideal in pretty much all situations for mobile DJs, fixed installation. 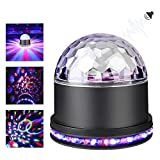 ❤Suitable for disco, ballroom, KTV, bar, stage, dj,disco,club, party, roller skating rinks, celebration, festival, store, park, gazebosand personal use etc. and look forward to your support and your positive affirmation. Do you have any questions please contact us, we will solve the problem for you.